Mine was June 7th, Anna’s July 6th, and Dad observed his on July 21st. He didn’t know when he was born because he was born in Greece and didn’t know the exact day. So he used the day that he first came to the United States as his birth date. Anna was turning 13, I was turning 14, and my dad was turning 47. For Anna and me, this was the first real birthday party we’d ever had, complete with food, balloons, friends, presents, and a whole celebration. Mom made sure we had a cake to share, but we never had a party or a celebration with friends. Part of the territory that comes with transience and living on the fringes of society is not having roots that are anchored in routine, tradition, and community. The birthday party that Anna planned was so thoughtful and perfect that it left me with an overwhelming sense of death and loss. I wanted to be happy because that’s what a normal person should feel on a happy occasion such as this. But I couldn’t escape the fear and sadness that I had accumulated over 14 years and knew it would be a futile attempt to be happy for myself. I could be happy for Anna and my dad, so that’s what I did. I smiled and participated in their happiness. All of the same relatives from our initial family reunion were there: Kerry, Mike, Jerry, Eliza, Uncle Ted, Poppy and our brother Donny. We had a pool party with a BBQ, and danced, sang, and opened gifts. My dad was completely exhausted by the end of the evening and excused himself around 9:00 PM to go to bed. He needed to be up bright and early the next day for work; I admired his discipline and work ethic. The only thing that he wasn’t disciplined about was smoking. He loved to smoke. After the party, Anna, Donny, and I stayed up late talking as it had been a long time since we had been able to spend time with our big brother. Anna and I updated Donny about some of the things he had missed since moving away from home. We told him about creepy Chris and the Indian reservation, not attending school, and having to escape in the middle of the night. I explained that it’s easier in Palm Springs for us to get to school because the school is literally just across the street and the kids are nice. They didn’t try to beat us up like they did in the other schools we attended. Anna changed the subject by asking Donny to tell me what he had learned about our dad. Donny lightened his demeanor, as he carefully chose his words and said, “Tony needs to have a bypass surgery.” “What’s a bypass?” I asked. I thought that was a very nice offer from a step-son to his step- father, but that defined Donny. He was selfless, which was why we hadn’t ended up in an orphanage home before now. He was used to making great sacrifices; it’s just what he did and who he was. I said, “I don’t understand and have never heard of this before, but he should do what his doctor tells him to do and I’ll come back and help as well. We can all help. It was time for me to go back to Palm Springs. Anna was sad that I was leaving, but I promised her that if Mom wasn’t nice or did anything to hurt me, that I’d come back to stay. I continued packing up my things into the piece of luggage that my dad bought me. It was nice not using a paper sack like I had in the past. He came and sat on the side of my bed, looking sad, tired, and worried. I stopped packing and sat down next to him and asked, “What’s wrong?” thinking that he would share the news about him needing heart surgery, but he didn’t. I was relieved that my dad didn’t put down any barriers or ultimatums about my going back, because he certainly had the right and power to do so. In a sense, I was born in the wild and any feeling of being trapped would have sent me running; his wisdom of letting me choose ensured my return. Donny gave me a hug and, in his burly voice, said “Be good, kid. I love you” and then it was Dad’s turn; he gave me a hug and started to cry. “Dad, please don’t cry; I’ll come back.” I said. He started speaking to me in Greek and held me for a long time. I felt every piece of his broken heart in our embrace. I knew my dad was crying for me and not himself, and in this I could feel the truth of his love. Mom didn’t cry or worry for us; she only cried for herself. The depth and emotional tone of her tears revealed the distinct difference. The mystery of not knowing my father left a void that made knowing myself impossible, and now I finally had the other half of who I was right in my hands. I was like him even though he hadn’t raised me. I had his blood, his resilience, and his loyalty to family, and now a bond that gave me an inner sense of legitimacy. The hardest part was that I didn’t know how to say good-bye. I had never learned. I only knew how to leave, never to look or turn back. Our neighbors Kelly and her daughter Jennifer picked me up at The Palm Springs Airport because Mom couldn’t make it. Kelly had dinner ready for me when we returned home. They were excited to hear all about my visit with Dad, because they too were Greek. The birthday party was easier on me as a memory and in sharing each moment with Kelly and Jennifer I got to enjoy it in a way that I couldn’t when it was actually happening. I relished sharing the details about my father: how he cooked for us every night, his will to work and take care of his loved ones, and how much the people around him loved and admired him. It made me proud that he was my father. Hours passed, darkness fell, and I slowly said good night and walked across the courtyard to our apartment. It was dark, which told me no one was home and that was fine because I was a little scared to see my mom after being gone for a couple of weeks. I showered, brushed my teeth, climbed into bed, and fell asleep thinking about how strange life was and how it didn’t feel real at times. 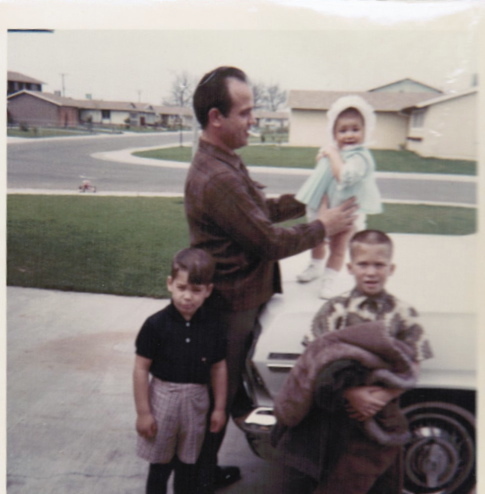 I had spent so many years loving and looking at the picture of my dad holding me on the hood of his car, and now I actually knew him and he knew me. After so many years of pining, it was a gift to finally meet the man responsible for giving me life. It was early, maybe 7:30 or 8:00 am, when the phone rang. I slowly grabbed it and, half asleep, answered, “Hello?” It was Anna, hysterically crying and trying to tell me something. But I couldn’t understand or make out what she was saying through the tidal wave of emotion in her voice. A shot of adrenaline started coursing through my body and I began to shake, and I said “Anna, slow down, I can’t understand a word you are saying!” As best as she could, she tried to calm herself by taking deep breaths, but continued crying. After a few failed attempts at speaking, painfully she whispered, “Dad is dead. Dad is dead. Dad is dead. 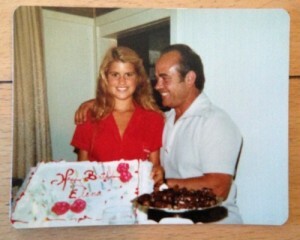 Dad and I celebrating my 14th Birthday.